Cost of membership Please see our website for tuition costs. Mission Statement The purpose of Running River School is to provide an educational environment that strongly respects the child as a multi-dimensional being, and recognizes that growth takes place in developmental stages. Learning happens in ways, and at stages, that are most fitting for the child to flourish as a whole human being. The multiple aspects of human development supported by Running River School include the physical, both brain and body, as well as the emotional and mental. This approach serves to foster a life-long love of learning, a deep sense of self, compassion and social integrity. These holistic goals, along with academic success, will serve both the individual and the larger community our children will belong to. 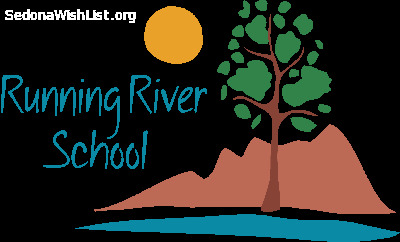 Services and Projects Running River School is an independent grade school initiative, inspired by Waldorf education, serving 1st through 4th grades as of 2016 (adding a grade each year). Currently we are working on boosting enrollment, extending our outreach efforts and organizing family-friendly events for the community. Running River School is planning a public/community event in May and we are hoping to borrow (or be gifted) 3-4 pop up shade tents in good condition and good size. 8x10, 10x10 or larger would all be welcome. If you would simply like to loan us your pop-up tent we will take all measures to return your tent to you in the same condition it came to us! Running River School, an independent Waldorf-inspired school, is looking to build a stronger Substitute Teacher list. If there are any retired teachers, or teachers who are currently substituting, who would like to occasionally step into a holistic educational environment we would love to hear from you. We are specifically looking for warm, nurturing, fun and adaptable individuals. Waldorf experience is highly desired, but since it is hard to come by in our area, we are fully open to experience in other educational settings. Are you interested in working with children in a small school setting? Running River School is looking for volunteers in the classroom to relieve our lead teachers a few hours a week. Specifically we are looking for people with skills and interest in the following areas: watercolor painting, foreign language, movement/games, kids yoga/meditation, crafting (and possibly other artistic subjects depending on their relevance). A volunteer could work anywhere between 1-3 hours per week (more if desired). We need at least a semester commitment. All volunteer hours are after 10:30am and before 3pm, Monday-Friday. Required: meet with teachers/admin; fingerprint clearance card. An ideal volunteer candidate will have had experience with children, and/or classroom management, and/or "curriculum" planning (retired teachers welcome!). Even more importantly, we are looking for warm, friendly and nurturing personalities with flexibility, a healthy sense of humor, and lots of energy! Experience with Waldorf education or the work of Rudolf Steiner would be an amazing match, but not required. We are a small community school inspired by Waldorf education with a family-like environment and well behaved, respectful students. We have three classrooms: grade 1 (8 students), grades 2/3 combined (9 students), grades 4/5 combined (12 students). Please call Lupita at 928-301-3232, or email info@runningriverschool.org, if you are interested in being a part of the children's community of Sedona! It's that time of year again! Running River School is putting out the call for donations of items in good condition to sell at our Annual Yard Sale Fundraiser. We are accepting household items of all sizes, from knickknacks to furniture. Items can be dropped off at 255 Goodrow Lane, near the garage, or you can schedule a pickup by calling (919) 895-8612. Thank you in advance for your support! 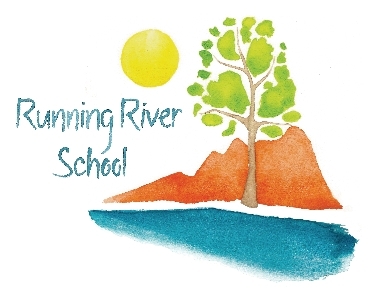 Running River School continues to be operated almost exclusively by parent volunteers. Currently the only paid positions are the teachers. Your donation of unwanted items gets turned into financial support that goes directly to support our students and teachers. You can feel also feel good that you are participating in sustainable practices by recycling your unwanted items! Thank you for your consideration! Please contact us at (919) 895-8612 if you have any questions or would like to schedule a pickup. Running River School grades 3 and 4 are hoping to hatch chickens and raise them until they are ready to go to the home of one of our teachers. We are looking to borrow a simple egg incubator with automatic egg turning and humidity/heat controls. 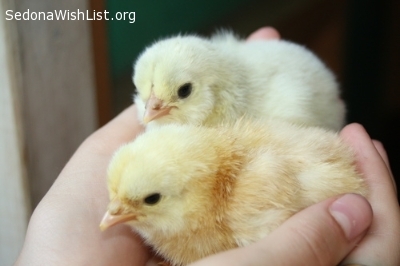 We have a lead on a heat lamp, but we are also looking for a feeder and waterer for when the chicks hatch. Please contact Eddie at 478-951-9348. It's that time of year again! 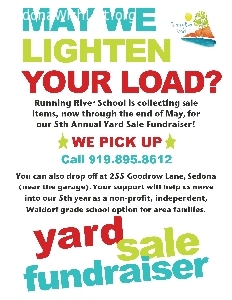 Running River School is putting out the call for donations of items in good condition to sell at our Annual Yard Sale Fundraiser. 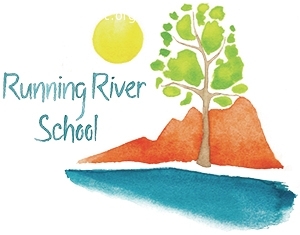 Running River School continues to be operated almost exclusively by parent volunteers. Currently the only paid positions are the teachers. Your donation of unwanted items, that gets turned into financial support, goes directly to support the children and the teachers. You can feel doubly helpful that you are also participating in sustainable practices by recycling your unwanted items! We can pick up a large amount of items, or large items like furniture. 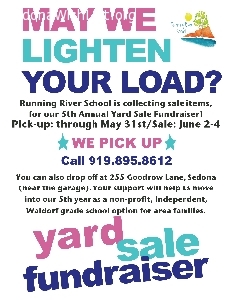 If you have just a few things we would appreciate it if you could drop them off at Goodrow Lane (across from Safeway and behind Sedona Rouge, NOT off of 89A), near the garage. Thank you, in advance, for your support! Please call 919-895-8612 to schedule a convenient pick up, or for more information. Running River School is planning a FREE family-friendly holiday event for December 11. 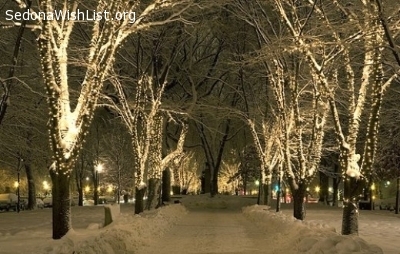 We are asking for donations of working Christmas lights (used or new). We would also be open to borrowing them and returning them after the event. We would welcome any type/color of string lights (LED might be preferable if you would be donating a new string of lights). This will be our first winter holiday event and we hope to grow it over the years. Your donation will help us get started on creating a free and fun holiday event for Verde Valley families. This is a great way to support our outreach efforts, aimed at growing Running River School's enrollment and sustainability, as another quality grade school option for area families! Thank you for your kind consideration! Running River School is planning a family-friendly holiday event for December 10. We are asking for donations of working Christmas lights (used or new). We would also be open to borrowing them and returning them after the event. We would welcome any type/color of string lights (LED might be preferable if you would be donating a new string of lights). This will be our first Christmas holiday event and we hope to grow it over the years. Your donation will help us get started on creating a fun holiday event for area families. And it's a great way to support our outreach efforts, which will ultimately help Running River School grow! A heartfelt "Thank you!" to our Sedona community who donated to our annual rummage sale fundraiser. You helped us raise over $7,500, which will help us meet our operating costs and/or help us offer tuition assistance to area families who need financial help to attend. We appreciate all that you do for your community, be it donate or volunteer or help to get the word out about our many worthy non-profits in the area. We appreciate your ongoing support! Running River School is still collecting donations of items in good condition to sell at our Garage Sale Fundraiser. The garage sale will be held the first weekend in June, so we will be collecting through the end of May. It's a super easy, and practically free, way to support school choice for Sedona! It will be our first year implementing a Tuition Assistance Program, which means your donation will help us offer significant financial assistance to incoming families! We turn your unwanted items into money for school operations. You can feel doubly helpful that you are also participating in sustainable practices by practicing The Five R's: Refuse, Reduce, Reuse, Repurpose, Recycle! We can pick up a large amount of items, or large items like furniture. If you have just a few things we would appreciate it if you could drop them off at 995 Rodeo Road, near the garage. Thank you, in advance, for your support! Please call 928-362-2659 to schedule a pick up or for more information. We received a donation of a printer just after ours died. Thank you to Astara who was donating to our garage sale ... she happened to have just the thing we could use right away! It's that time of year again! Running River School is putting out the call for donations of items in good condition to sell at our Garage Sale Fundraiser. Hi Sedona Wish List Followers! 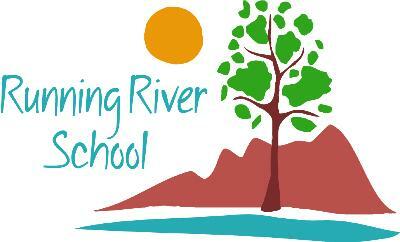 Running River School is currently moving the classrooms to a new location. We are re-purposing most everything we already own, but have come up with one extra need. We are hoping to find some good sized planters to plant flowers and such, to add some beauty to the children's new environment. If you have any decent sized pots (not too small) in good condition that may need to be re-homed we will pick them up. We may be able to make a small monetary contribution, if that kind of exchange is important for you. Please contact Lupita at 928-362-2659 if you have anything to offer. Many thanks to you, from Running River School! A heartfelt "Thank you!" 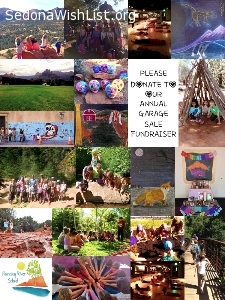 to our wonderful Sedona community of gift-givers for our third successful garage sale fundraiser. With your donations of unwanted items we raised $6000! And, we are very close to having a balanced budget for next year! If there are any angels out there who would like to make a tax deductible monetary donation to the school, please contact us. We hope you will consider us again next year for our 4th amazing garage sale fundraiser! All our love, Running River School. Our garage sale fundraiser is coming up and it's often a challenge to get clothes to sell. We would like to borrow some clothing racks (retail or personal) just for the weekend of the sale. If you would like, we can offer a refundable deposit, just so you can feel safe about making the loan. Thank you for considering us! P.S. We are still collecting donations for the sale so if you have anything to offer please give us a call at 928-362-2659! Running River School is still seeking donations of typical garage sale items in good condition through the end of May. Here's the best part, WE PICK UP! You don't even have to leave home to get it to us! We can take furniture too. We do realize that most people have a favorite thrift shop they support, but we are hoping some of you are open to spreading the love around, just for a short time. We are collecting for only one more month, so your favorite shop/organization can still be supported the rest of the year! Thank you for considering us! Last year, with the help of the community, we were able to raise around $7000, which went directly to overhead such as rent, utilities and teacher salaries. It may not seem like much to some, but it makes all the difference to us! Sending you gratitude for all you do for your community. All organizations on this site could not operate without your generosity! Hello Sedona Community of Givers! 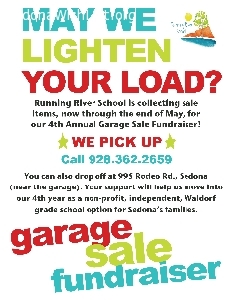 It's that time of year again when Running River School starts collecting for our annual garage sale fundraiser. We are seeking any type of typical garage sale item in good condition through the end of May. Here's the best part, WE PICK UP! You don't even have to leave home to get it to us! We do realize that most people have a favorite thrift shop they support, but we are hoping some of you are open to spreading the love around, just for a short time. It is only a coupe of months that we collect, so your favorite shop can still be supported the rest of the year! Running River School is starting the planning for our biggest yearly fundraiser, which is a gigantic garage sale that happens at the end of May. Last year's garage sale amounted to approximately half of our part-time Teacher Assistant's salary! This year we are planning to start collecting and organizing earlier. What we need, to be able to achieve this, is a storage space that we can easily access during the day. An actual large storage unit, at one of the storage companies, or a two car garage would be most ideal. We could also pay a small amount for this donation if it becomes necessary. When I think about donating to any organization I personally want to know if the organization is being run in a fiscally responsible manner. So, here is some background on our operation. Until Running River School can afford a more permanent location to call home, which will also give us the stability to allow for a larger student base, we are dependent on the generosity of the community to supplement our financial obligations. (It is kind of a "chicken and egg" situation, but we remain optimistic!) Most of our costs are covered through tuition, but in order to keep tuition affordable for the community it won't cover all of our costs until we reach a certain point in our growth. We keep it simple! Our costs are teacher's salaries and employment costs, insurance, rent and utilities, bookkeeping and administrative costs not associated with an administrative salary. All of our administrative/organizational work, fundraising work, graphic design work, event planning, field trip planning and chaperoning, cleaning, etc. are covered on a volunteer basis by our small parent group. By our estimations, our board and parent group donate the equivalent of at least two full-time salaried positions per year! How's that for dedication!? If you might be able to help us with our current need please call Lupita at 928-301-3232. Thank you! Happy new year to everyone! Good luck with all of your endeavors this year! Running River School has an upcoming fundraiser event in December (watch out for it!) for which we have partnered with John Soderberg, who is working to support arts education for children. We could really use the ability to get this event widely advertised. Perhaps you have an ad package or contract with one of the local papers that isn't yet fulfilled and you might be able to gift us an advertising spot? We do not currently have an advertising budget, so we rely on flyers around town, online calendars and word of mouth. But, for this special art event it would be great if we could really get seen with an advertisement or two! Doesn't matter what size; color or black and white ... anything would be better than nothing! My son comes home and practices his cartwheels, handstands, round offs and balancing abilities until bedtime. My guess is he is really enjoying his gymnastics class! Our gym teacher, Miss Carrie, is still looking for approximately $90 to set up one aerial silk in the classroom to practice these gymnastics skills off the ground. Great for balance, agility, self confidence, strengthening muscles and general body awareness. Let us know if you would like to support our children on their gymnastic journey! (Photo: Miss Carrie with two students while on a field trip). Please call 928-301-3232 if you would like to help. Our mailing address is PO Box 299, Sedona, AZ 86339. 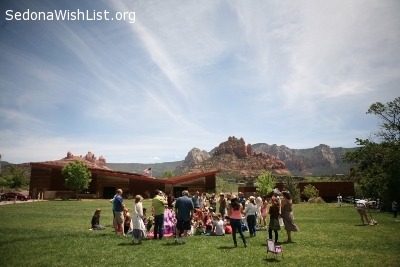 Hello Sedona Wish List Followers! Our little ones are beginning their Spanish language journey this year, and are absolutely loving it! One item we are missing is a felt board for interactive activities. Our teacher will be making the pieces specific to each language project, but something to put them on would be most helpful! Handmade would also be fine. Maybe you have one lying around from when your kiddos were younger? You can contact Lupita at 928-301-3232 for pick up arrangements. - Kids who exercise are more likely to keep exercising as an adult. - Exercise helps kids achieve and maintain a healthy body weight. - Regular physical activity helps build and maintain strong, healthy muscles, bones and joints. - Exercise aids in the development of important interpersonal skills—this is especially true for participation in team sports. - Exercise improves the quantity and quality of sleep. - Research shows that exercise promotes improved school attendance and enhances academic performance. - Kids who exercise have greater self-esteem and better self-images. - Participating in regular physical activity prevents or delays the development of many chronic diseases (e.g., heart disease, diabetes, obesity, hypertension) and promotes health. - Children who are active report fewer symptoms of anxiety and depression and a better overall mood. - Exercise helps improve motor coordination and enhances the development of various motor performance skills. Running River School has hired an amazing assistant for our upcoming school year who has extensive training in gymnastics and the circus arts. We want to utilize her skills to enhance our "whole body" curriculum (head, heart and hands). We are in need of a few items to use for instruction. 4. $90 to buy the supplies needed for "aerial silks"
You may sometimes ask yourself why a private school needs funding. I have the answer for you! Did you know that the vast majority of small private schools across the country hardly ever can cover their costs by tuition alone? This is also the case for us! Your next question might be, why do private schools operate this way? The answer to this one, is also very simple. If we were to charge a tuition that would guarantee covering all costs nobody could afford to go! Our reasonable tuition was set in the hopes of making our alternative educational choice available to as many as possible. We also have one of the lowest tuition costs in the country for what we are offering. Which, in turn, requires us to reach out to the community for donations and support for our fundraising efforts. Thank you for considering us! A big thank you to Trudy for donating items to what has shaped up to be a MASSIVE garage sale! We have been gifted with some wonderful stuff to create funds for our next year. Come support us by finding that treasure you have been looking for. It's environmental to boot, you are recycling! Anybody interested in the Sale can come this Friday and Saturday, from 8am-2pm, to 995 Rodeo Road, Western Hills, West Sedona. Hope to see you there! Are you ready for your unloved or unused items to find a new home? Let us turn these items into financial support for our upcoming school year. We are having a huge fundraiser garage sale very soon, but there is still time to donate your unwanted household goods, furniture, jewelry, clothes, shoes, tools, toys, etc. (decent condition please). Spring cleaning feels so good, doesn't it!? You may drop off or we can pick up. A big shout out to Audrey for hearing our call for donations to our upcoming fundraiser garage sale! Audrey donated some lovely items which will be turned into dollars for us to grow into our second year. We appreciate your support, Audrey! We have received other anonymous donations, so thank you to our Sedona Community! A little time left to donate to our Garage Sale Extravaganza. Or, come see us for the sale on May 30 and 31 at 995 Rodeo Rd., Western Hills. This is an easy one folks! We are having our yearly garage sale fundraiser and all we need from you is your unwanted and unused items! Are you spring cleaning or downsizing, or moving in or out. Your donation will help us grow into our second year! You can drop off at the sale location before May 29th at 2715 Prairie Falcon Drive, or give us a call and we can pick up a large quantity or larger items. Thank you for your help, we appreciate your consideration! Got an hour to give, and a thirst for knowledge? Are you interested in learning about Waldorf education? We would love to introduce you to what Waldorf looks like at the grade school level, and present our program serving 1st and 2nd grades in the fall. Please join us for a short presentation, with time for Q&A as well. We have a great need for a professional graphic designer and/or website designer. We do have a working website that we have created for ourselves but would someday like to have a more comprehensive, optimized and highly professional site that can convey the kind of quality we represent as an educational institution. We also currently do our own design, which works out nicely for us, but we are interested in having a full suite designed that is a cohesive representation of who we are. We are looking for a professional in the PR and Marketing field who is interested in supporting our educational endeavor. Our needs in this area are threefold: We need to reach parents in our area, parents coming into Sedona and potential donors. Right now our time and limited funding are focused on the parents of our community. Our number one priority is growing the school, so it makes sense for us to put our focus into the recruitment of potential students. But our outreach can't stop there! We don't need just any realtor, we need a realtor who also believes in what we are doing. One of our core beliefs is that to change the world, our children need to be raised and educated in a more holistic way than ever before. Our immediate need is an affordable (or even better, donated) space to use temporarily. We are small, so don't need much space but we do need outdoor, as well as indoor space. Our grand vision includes the donation, or deeply discounted purchase price, of acreage.